In a winter seemingly more filled with rumors than reality and lost possibility than realized gain, it appears the Twins have finally made a move to improve the team—simply by signing one of their own players. As of last report, the Twins were near locking-up designated hitter Jason Kubel for two years, with a team option for a third year in 2011. Only a few details remained to be worked out. The Twins desperately needed to make this move to keep one of their few 20 home run hitters from bolting the barn, as have so many other productive players. In Twins’ Territory, true homegrown power hitters happen about as often as World Series victories. So they now can rely on Kubel for the foreseeable future to provide consistent power and production from another one of their perennial trouble spots—DH—while taking some pressure off Justin Morneau and a hopefully-rejuvenated Michael Cuddyer. Kubel, 26, provided significant production, as well as key hits, for the team in ’08. He batted .272 with 78 RBI to accompany those 20 dingers. He really grew into the DH role last season and has shown improving production over the past three seasons, since recovering from major knew surgery and receiving more playing time. In 2006 he hit eight home runs and drove in 26 RBI, batting .241 in his first season back after injury. There was significant improvement in ’07, when Kubel smacked 13 homers with 65 RBI, batting .273 in 418 at bats. In ’08 he had even more playing time (462 at bats) and proved he is the type of designated hitter the Twins can rely on for some power. Looking back, the Twins haven’t received consistent production from the designated hitter spot since the days of Chili Davis and Paul Molitor. Year-by-year, Kubel is proving he can be the hitting star the team first projected he would be in his minor league days. He is also demonstrating he deserves to be the permanent DH, with the occasional spot start in the outfield as needed. 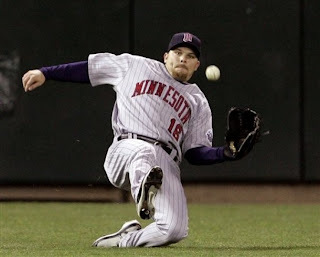 Now if the Twins would take a chance on signing a reportedly-rehabilitated Joe Crede at third, and if Michael Cuddyer can return to near 2006 form, they might have a team that can compete with the White Sox and Indians. A team with the potential to win games with their bats.